Virgin Galactic on Monday successfully completed a rocket-powered test of its SpaceShipTwo (SS2) aircraft, in the process breaking the sound barrier while soaring 55,000 feet high. 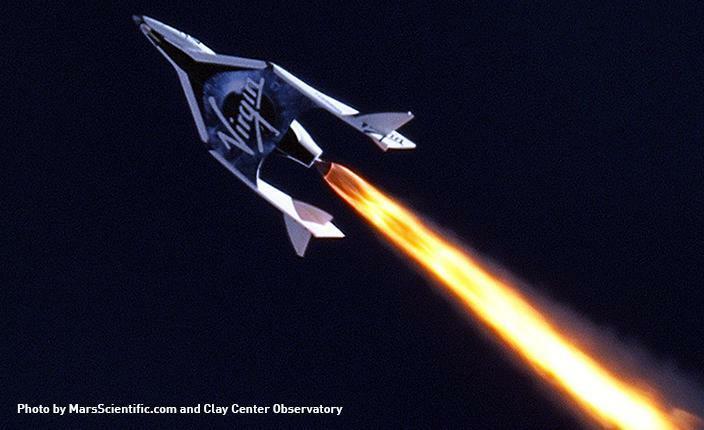 In a flight that last around ten minutes, the momentous event is a first step toward Sir Richard Branson's—who founded and currently co-owns Virgin Galactic—goal of sending regular people to space. Elon Musk isn't the only one dreaming of commercial space flight. "The first powered flight of Virgin Spaceship Enterprise was without any doubt, our single most important flight test to date," Branson said. "For the first time, we were able to prove the key components of the system, fully integrated and in flight." Branson said today's test propels the project closer to going to space, which he expects to happen by year's end. "We saw history in the making today and I couldn't be more proud of everyone involved." The test took place with SS2 mated to WhiteKnightTwo (WK2), which wound up flying SS2 to about 47,000 feet. Once SS2 was released, and checks and balances were verified, the spacecraft's five passengers ignited SS2's rocket motor, pushing it past 55,000 feet while going supersonic; the engine burn lasted for 16 seconds. Virgin said everything went smooth, with the test coming to an end around 8:00 a.m. this morning. "We will now embark on a handful of similar powered flight test, and then make our test flight to space," said Virgin Galactic President & CEO George Whitesides. If all other tests go forward without issue, the company expects full space flight to take place before the end of 2013. Who's up for the first smartphone unboxing in space?